Hawaii’s beaches are its main visitor attraction. But to truly experience the breadth of Hawaii’s beauty, you have to also head for the hills, to be in Hawaii’s mountains. The magnetic appeal of Hawaii’s crystal-clear waters and white (and black) sand beaches draws visitors from all over the globe. On any sunny day throughout the year, Hawaii’s most popular beaches are thronged with both visitors and residents. Sipping tropical drinks on the sand during a fiery Hawaiian sunset is a quintessential part of the visitor experience. But from practically any beach in Hawaii, jagged green peaks perforate the blue sky in the distance. Visitors on the beach seldom venture into Hawaii’s wild places. Perhaps fortunately for them, they’ll never know what they’re missing. They’d kick themselves if they did. A nest of waterfalls waits for the rain. Many mountain trails, particularly on Oahu, are just a few miles from popular beaches. And to wander the forest is to be immersed in a part of Hawaii that simply cannot be captured in a postcard or social media post, no matter the filter. Sure, come to Hawaii for the sunset Mai Tai, but stay an extra day or two for the communion with the majesty of the mountains. There are hundreds of hiking trails throughout the islands, with levels of difficulty ranging from novice to experts-only. Many of Hawaii’s mountain trails are easily accessible and well-marked and maintained. The most popular trails on Oahu see a considerable amount of traffic because of that. Many trails end at dramatic waterfalls. Even on Hawaii’s busiest trails, however, moments of tranquility and quiet wonder await at a babbling stream or cresting hill. A break in the canopy can offer panoramic views of the forest that one can only see from the forest. The Manoa Falls Trail just outside Waikiki is perhaps the most traveled in Hawaii. It remains a deeply personal journey. Even the chattiest group of 20-somethings will fall silent during a hike in the mountains. The echo of the human voice ultimately seems out of place in the chorus of birdsong and the gentle lapping of clear mountain water on smooth river rocks. The ghostly whisper of the wind through ironwood trees needs no accompaniment. Some hikes will take you into and above the cloud line. When that happens and the view vanishes into the clouds, words become pointless. A proper hike in the forest is also an olfactory adventure. Depending on the time of year, the musky, cinnamon-like smell of the native lawae fern mingles with lemon grass. Passion fruit, or lilikoi, is instantly recognizable, sometimes sickly sweet as fallen fruit decay and return to the soil. Mangoes and mountain apples fill the air in their season. Every Hawaii valley and towering peak is a living archive, home to ancient myths and legends of love and loss, of bravery and betrayal. To enter Hawaii’s mountains is to find the true Hawaii. The past is present, seemingly a million miles from the realities of modern life. 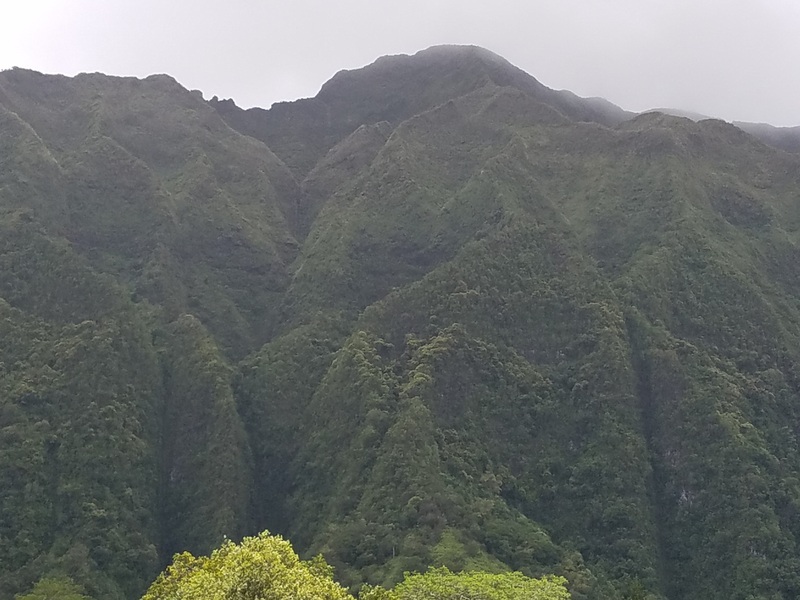 the base of the Koolau Mountains on Oahu. Like all things beautiful and mysterious, there is an element of danger in the mountains of Hawaii. Flash floods during a heavy rain, however brief, can be life-threatening. Jagged cliffs and unsure footing can be fatal to the inattentive or unprepared. There is an abundance of resources available through various city, state, and federal agencies available to Hawaii hikers. Just a little bit of research and good preparation will keep you safe and let you experience natural Hawaii in a way that few visitors seldom do. And, of course, Hawaii-Aloha Travel is here to help you plan your unforgettable journey into Hawaii’s mountains. 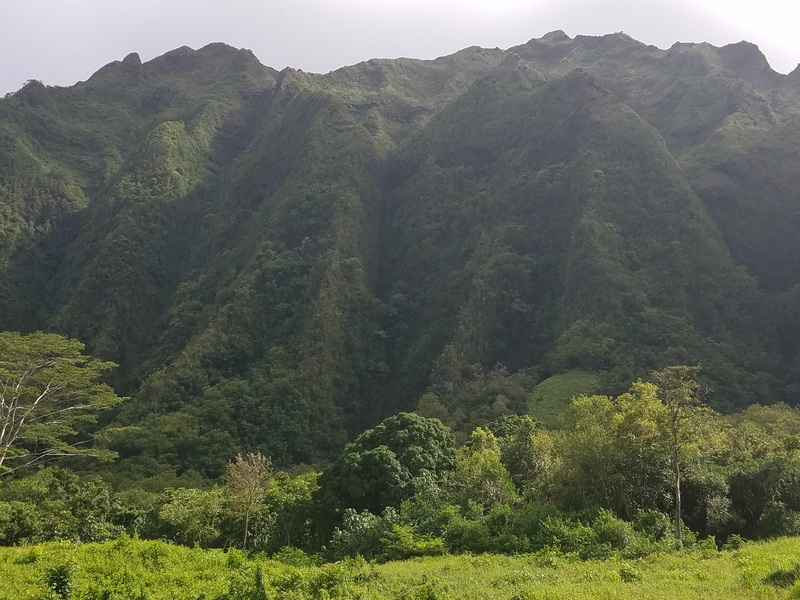 For a Department of Land and Natural Resources primer on hiking in Hawaii’s mountains, click here.